Sound itself is a very powerful energy. This sound in tune with nature helps all the living beings to attain peace of mind and in humans, many a times, helps him to seek within. That’s why the sound (nada) is called Brahma i.e. Nada brahma and this art is blessed by Goddess Saraswati. When this music is played in tune and harmony in different forms called as Tala and Raga, it is possible to change the mental pattern as well as get rid of the physical ailments. Hence, this sound of music is now recognised as Music Therapy.In Nature Cure, a disease is due to imbalance of the Pancha Mahabhutas in the body. Hence, when the body and mind are brought into harmony, the disease / disorder is cured from the root and not just suppressed. The traditional Classical and Hindustani music acts on the body, mind and soul of the artist and also on the listener. Thousand of pages have been written, saying the greatness of Indian Music on Mind, Body and Soul and its Healing Nature. Music has 3 important pillars namely Singing, Dance and Instruments. To sing had always been considered an Art in itself with the blessing of God. Very few are blessed with a soothening voice to invoke joy, pleasure, peace in another living soul. Music affects not just humans, but animals and plants too. It is Yoga in itself. When a person sings not only mouth, tongue and throat work but in reality the entire spinal column from root of the spine to the head and all the meditative charkas are thus evoked, as sound originates from the umbilical region, travels through the head and then in the throat and out through the mouth. While playing the instrument, as the maestro plays, he/she forgets the world and is one with the music, as is the singer, one with the music when he sings! Dance is the third form, where the dancer is in sync with the music and controls his body movements according to the necessity. He controls the body and thus gains control over the mind, being one with the dance. This shows that music is Science and an Art. Learning music has a smoothening effect but listening to good music is very beneficial in the realm of Naturopathy. Listening to good music brings in energy, spontaneity, happiness, alertness. Every cell in the body is energized; there is increased vitality with peace of mind. Music can play an effective role in helping us lead better, fruitful lives. Listening to specific kinds of music at specific times of the day has been shown to be helpful in maintaining good health. 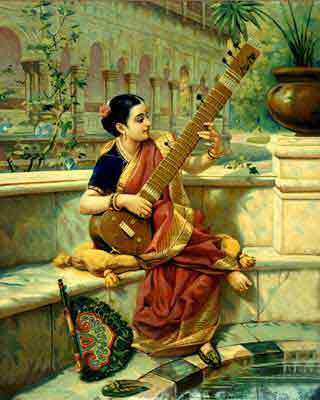 Indian music, with its many Ragas, is known to be particularly therapeutic value. The curative power of music emanates from the resonance of certain ragas on hormonal and glandular functions which produce secretions that keep the body balanced and thus heals. It is believed that music stimulates the pituitary gland, whose secretions affect the nervous system and the flow of blood. Indian folklore had a tradition of ‘Bhajan – Kirtan’ on all occasions of festivals and rituals etc. This is a type of Treatment where music helps one to forget once life’s chores and tension for few hours and he gets energized and healed due to the charged up atmosphere and joy which music brings. Modern medicine had already accepted the penetrating power of sound by inventing and regularly using modern diagnostic instruments like Ultrasound. Since many decades, Film/Cinema songs have been a source of inspiration and songs have been written for every occasion and mood of the human mind. Endless examples of Tansen lightening the lamps by singing Raga Deepak, many modern maestros have cured diseases through music. Modern science and medicine are now rediscovering the healing powers of music. And music therapy – the specialized use of music in treating persons with special needs in mental and physical health, rehabilitation and special education, is gaining ground. In the West it is now an accepted form of treatment even within orthodox medical’ practice. In USA, raga Gorakh Kalyan is successfully used in hospitals to cure Hypertension. The Raga Research Centre in Chennai, India, is currently making a comprehensive study of Indian ragas and evaluating their therapeutic potential with the help of musicians, doctors and psychiatrists. Musical experience involves emotional titillations, resulting in the kidnap of the mind. By diverting the mind from its concentration on a pain location (or a painful experience) music can work like a pain-reliever without any side-effects. It is believed that classical Indian ragas can benefit a whole host of conditions like Indigestion, Arthritis, Epilepsy, Insomnia, Hypertension, Asthma, Chronic Headaches, Hemorrhoids, Arrhythmia, Ulcers and Cancer Rehabilitation etc. “Western audiences are always astonished to see Indian classical artistes perform without musical notes unlike our western counterparts. They are surprised to hear Indian artistes perform a raag for hours without any notations. Indian music has emotions and it unites us with an unseen divine power. Though Indian artistes follow an ancient raag, they are free to innovate.” Said Pandit Vishwamohan Bhatt, world famous Mohan Veena player and a Grammy Award winner of 1994 in an interview in Pune-India. Note – One should listen to the said Ragas, when one is totally relaxed, alert and should focus his attention to the sound of music.